f.29' Scene in valley of Sulphur from the South. Feby 17th, 1840' (Near Lakhi Pass, Sind). Description on f. 28v. bl.uk > Online Gallery Home	> Online exhibitions	> Asia, Pacific and Africa Collections	> f.29' Scene in valley of Sulphur from the South. Feby 17th, 1840' (Near Lakhi Pass, Sind). Description on f. 28v. 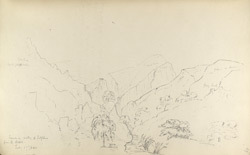 Pencil drawing of a scene near the Lakhi Pass by George Boyd (1800-1850), dated 25th February 1840. This is one of 95 drawings (90 folios), chiefly of landscapes and monuments in the Deccan, West India and Afghanistan made between 1821 and 1844. Boyd served in the Bombay Infantry from 1820 to 1850 and was mainly employed in survey work. From 1822 to 1831 he was in the Deccan and Satara; in 1835 he was on survey in Kathiawar; and in 1839 he was making road surveys in Sind. He was mentioned in dispatches during the war in Afghanistan in 1840 and in 1842 he worked on a survey between Quetta and Kalat. The Lakhi Hills, situated in Sind (Pakistan), are 50 miles in length and were formed by the volcanic activity as exhibited by the frequency of the hot springs and sulphurous exhalations that occur in the region. The Lakhi Pass is commanded by the town of Sehwan, a key strategic location for all invaders in the region.